For over forty years, Meg and Mog books have entertained millions of children and adults alike. In this instalment, Meg is getting ready for her special Halloween tea party when there is a disaster – her teapot is broken! What will Meg do? Well, she is a witch after all, so she does the only thing that she knows how to: uses magic to fix it. As any reader of the Meg and Mog series will know, Meg’s spells have a tendency to go wrong, and this time is no exception. Whilst this was not my favourite in the entire series, which now seems to be colossal when compared to the amount available to me as a child, it is good to see other characters and situations coming through in the books. 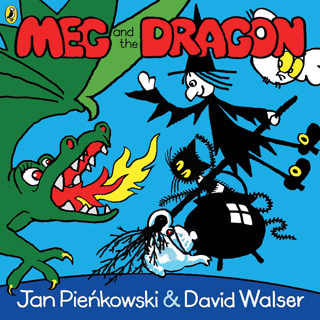 The Meg and Mog books are great for story times, and one of the greatest things about these books are the amazing bold colours and shapes, which are still as stunningly simplistic as ever. There are always lots of educational opportunities throughout each story, which you can engage any child with. You can explore shapes on the pages with your child, or try and count the amount of animals on a page, and dependant on how good of a story teller you are, you could even weave these little learning games into the story. Meg and Mog have always had an enchanting quality about them and they are always fun and magical. The stories never cease to capture the imagination and have remained fresh, inventive, and up-to-date over the years and through trends. These books have always been simple and easy to follow, and it should be an unwritten rule that all children should experience their delights. It’s what childhood is all about.